Morning Peeps, Berni here with another creation for the Dies R Us Inspiration blog! The Dies R Us on-line store carries a huge assortment of amazing dies by several manufacturers.Today I used a couple of dies, Sue Wilson Gemini Dies, Lyra and Elizabeth Craft designs Small Butterfly. Lovely Spring card Berni, gorgeous colours and I do love that Lyra die! A gorgeous card, Berni! I love those die cut flowers and the way you used that Sue Wilson die is fabulous. 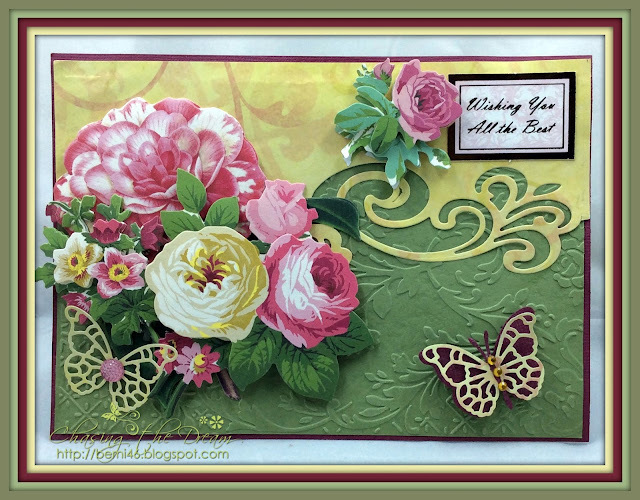 A sweet springtime card!! very pretty swirl border, so pretty with the delicate butterflies and your flowers are lovely too! So Pretty! Love your Designer Papers and choice of dies, sweet little butterflies! Beautiful colors and layering...........gorgeous card. Thanks for sharing. Mixing It Up - BD and AD!